A total of 10 million EVs could be on Britain’s roads by 2035, putting the market well on the way to meeting government targets without impacting disastrously on the grid – provided EV charging is smart. Aurora Energy Research says smart charging is key to ensuring the grid can cope with rising numbers of EVs. That’s the view of a new study by Aurora Energy Research that sets out how adopting smart charging is key to the integration of electric vehicles onto the power system. The report identifies that the key obstacles to mass uptake of EVs – cost, range and access to charging – all look likely to be addressed in the coming years, leading to take-up of 10 million EVs by 2035. And the report says that if battery costs fall faster than expected, then this number could even increase by up to 15 million electric cars in 2035. This follows calls from the Committee on Climate Change (CCC) last week for the Government to bring forwards its plans of banning new car sales of conventional petrols and diesels by 2040 to ensure Clean Growth Strategy ambitions are met. The report also responds to ongoing concerns over the impact on the UK grid, adding that 10 million electric cars will increase overall power demand by 19TWh per year – equating to only 6% of current power demand. However, the report said that key to minimising the impact on the power system is to think about how motorists are likely to charge EVs in the future, and for industry and government to help develop and encourage use of a smarter charging system. This follows a recent report by Electric Nation that found smart charging is vital to EV take-up. 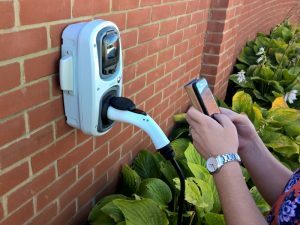 According to Aurora Energy Research, evidence shows that at present, most EV owners plug in and charge their car when they get home for work increasing the evening peak demand for electricity. If 10 million EVs were added to the grid and charged in this way it would require 3GWs of additional generation capacity at peak times, as well as requiring potentially costly reinforcements of the power network. However, if EV charging is ‘smart’ then these challenges are significantly lowered while also reducing the requirement to build additional generation capacity. Interestingly, Aurora’s research also highlights that as smart charging boosts off peak power demand, it can also improve the economics of wind power generation, increasing profitability by around 2%.